While winter is a great time to move (i.e., it's cheaper and an easier time to rent a moving truck or hire movers, see: Best Time to Move), you need to be aware of possible moving issues so that you can avoid them before they occur. Here are some suggestions for moving during the winter. Before moving day, it's a good idea to check with the real estate agent or the rental property manager of your new home to ensure that your new home is ready before moving day. Make Sure You Have Heat and Lights: It is a task you don't want to forget to do. You should ensure that all utilities have been set-up and are fully functioning. Turn on the heat and hydro a couple of days before your arrival to make sure everything is functioning and that the house is warm for the day you move in. While this is true for any time that you move, regardless of the season, it's even more important when the cold winds are blowing and the days are much shorter and darker. 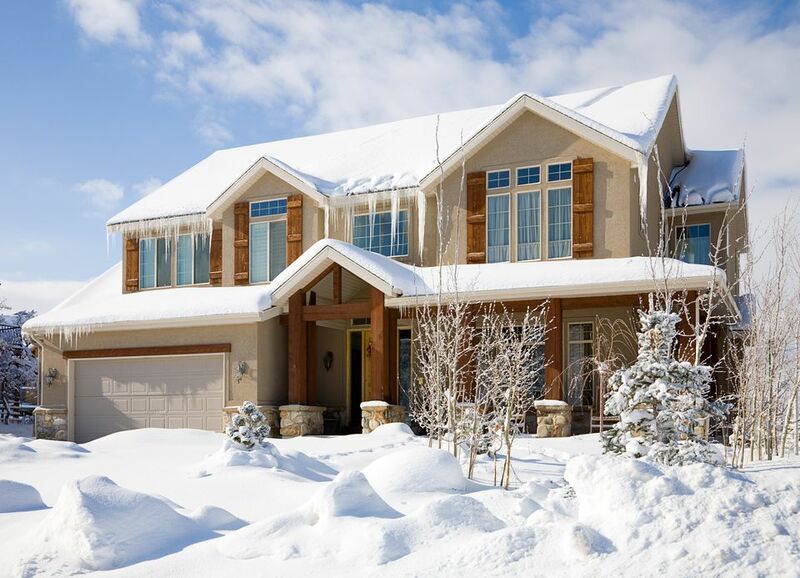 Clear the Snow From Walkways: Make sure the walks and sidewalks are clear in front of your new home. If you're moving locally, it's a good idea to visit your new place the day before the move in date to make sure the walkways are clear and free of ice. If needed, salt or sand the area. If you're moving to another town or city and can't visit your new home before the move-in date; have your agent or property manager check the area for you. Check That Parking Area And/Or Lane-Ways Are Clear: Regardless of what time of year you move, you should always ensure there's parking available for the moving truck. It may mean negotiating with your new neighbors or hiring someone (or doing it yourself) to clear the back lane-way or driveway of snow. Clear Snow: Make sure sidewalks, walkways, and driveways are free of snow. Use salt or sand to ensure areas are free of icy and slippery conditions. The parking area should also be cleared with ample room for movers to use dollies. Check the area first thing on moving day just in case it snowed overnight or that conditions changed. Protect Inside Space: Use large pieces of cardboard or plastic sheeting to ensure high traffic areas are protected from snow, sand, and water. If your floors can withstand heavy duty tape (test in a corner spot first), tape plastic sheets to the floor. Cardboard works best for carpeted areas as small tacks can be used to secure it to the floor. Experiment first before the movers arrive. Keep Sand/Salt and Shovels on Hand: It's a good idea to stock up on winter supplies in case your vehicle or the moving truck becomes stuck, or it starts to snow. Throughout the move, you should be monitoring conditions and acting on any changes as needed. Have Hot Drinks on Hand: Whether you're doing your moving or hiring movers, make sure you have hot liquids available. Hot chocolate, tea, and coffee will be most welcomed by everyone who's helping with your move. Extra mittens and hats are a good idea, too. Keep an Eye on the Weather: While this seems like common sense, on moving day, you'll be so wrapped up in the move that you may forget that conditions might change. Check the weather well in advance of moving day, then follow it closely right up until the movers arrive. If there's a possibility of inclement weather, keep the radio on during the move to ensure you're receiving the latest updates. Have a Backup Plan: If a winter storm is threatening your move, make sure you have a backup plan in case you need to reschedule your move. If you've hired movers, talk to the company to see what their policy is in terms of winter conditions. Some movers are used to winter weather and may not be willing to postpone the move. If the movers do want to postpone, make sure you speak to your real estate agent or landlord to see if you can stay a few extra days. Typically, if you're not able to move out, no one can move in, either. But arrange this ahead of time. If you can't negotiate extra days, speak to the movers about your options. They may still be able to pick up your things, but not deliver them to your new home. If this is the case, you'll need short-term accommodation. Find out how to secure short-term accommodation. Plan Your Travel Route Carefully: Know your travel route and make sure you contact the local authorities to determine if highways are open and safe to travel on. Each state or province has a phone number and website to check with regular updates provided. You should also know the location of overnight accommodation in case you need to stop. Get Your Car Serviced and Have All the Necessary Equipment With You: Make sure you have your car winterized, including all fluids topped up, and tires and brakes checked. It's a good idea to carry chains (if allowed) and know how to put them on quickly. Practice in your garage before you leave. You should also bring a gas can, extra windshield fluid, and salt or kitty litter (works great if you get stuck). Have a good snow shovel, emergency blanket and membership to a roadside assistance service, too. Have an Emergency Contact List With You: Make sure you have all the necessary phone numbers with you, including roadside assistance, highway patrol, and a number for reports on highway conditions. You should also ensure that someone who isn't moving with you has a copy of your travel plans. Make a call-in schedule with that person so they'll know where you are and when you should be arriving.